The annual projections for the upcoming hurricane season are out. Perhaps you noticed that Central Florida experienced a winter that was wetter than normal – a result of a LaNina condition that dominated winter weather patterns. This pattern is dissipating, transitioning into an El Nino pattern over the next several months – a gradual warming of waters in the western tropical Pacific. These warmer waters impact weather patterns in much of the tropics and sub-tropics and as the hurricane season approaches will impact storms this summer. In an early forecast, annual forecasters of anticipated hurricane activity are suggesting slightly above average activity for the 2018 hurricane season. The final projection calls for 14 named storms, 7 of which will be hurricanes and of these, 3 major hurricanes (categories 3 to 5). While the date often goes unnoticed, hurricane season begins June 1 and runs through November 30. As waters warm, potential for intense storms increases in August and September, then diminishes as the season moves into fall and water temperatures decrease. In recognition of the start of the season, and in an effort to encourage citizens to prepare, the State of Florida will offer a suspension of sales tax on goods related to disasters during the week of June 1 – 7, 2018. What kinds of purchases qualify for the “tax holiday”? 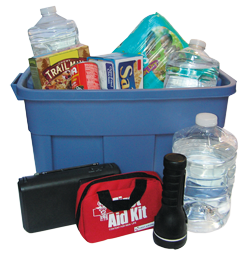 Things needed for disaster recovery – reusable ice packs, portable self-powered light sources (candles, flashlights, lanterns), gas or diesel fuel containers, batteries, coolers/ice chests, battery-powered radios, tarps, straps, bungee cords, tie-down kits and portable generators. 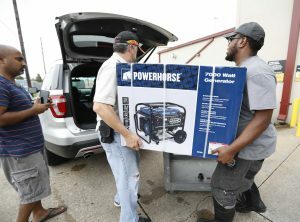 If you have shortages on your list of items needed for a storm – or if you are thinking about purchasing a generator – now is the time. Unlike immediately before the storm, items are in stock in local stores and one has the added bonus of no state sales tax. While waiver of this sales tax is an excellent incentive for the above-listed purchases, there is more that needs to be done to prepare for the season. This should be done now, at the beginning of the season. Start with water, and consider the recommendation that each household have one gallon of water per person for a 7 day period. Packaged dry food items that don’t need to be heated are recommended. Remember to use these foods at the conclusion of the storm season and to replace them next year as the season approaches. Good items for your food list include the following canned goods: fruits and vegetables, juices, milk, and soup as well as dry goods including peanut butter, jelly, crackers, granola bars, trail mix and comfort/stress foods like cookies, hard candy, sweetened cereals, lollipops, instant coffee and tea bags. Remember special foods for infants, elderly persons or those on special diets. Next, be sure to have at least one complete change of clothes and footwear per person. Remember that air conditioners will probably be out; make sure your clothing is appropriate for high temperatures. A first aid kit, whose location is known to all family members, should be assembled and stored. Keep items in your kit in air-tight plastic bags. Be sure to obtain tools and supplies for post storm use including a battery-operated radio and extra batteries, flashlight and extra batteries, non-electric can opener, utility knife, pliers, duct tape, and plastic storage containers. Stock up on paper plates, napkins, paper cups and plastic utensils. Remember to assemble a supply of sanitation items including toilet paper, towelettes, soap, liquid detergent, personal hygiene items, plastic garbage bags and ties, disinfectant, and household chlorine bleach. Finally, if you don’t have this already, obtain a waterproof, fireproof, portable container for important family documents and store this in a place you can easily access, preferably an interior closet. This container should include your will, insurance policies, contracts, deeds, stocks and bonds; passports, social security cards and immunization records and family records (birth, marriage and death certificates). Finally, consider any trees on your property. The time to have tree work done is prior to the storm season. Hire a certified arborist to examine trees and conduct pruning necessary to minimize damage. Take advantage of the upcoming sales tax holiday, June 1 – 7. But more importantly, take the opportunity to review your preparedness for a storm and assemble missing goods now – while stores have supplies and while lines are short! David Holmes has over 30 years experience with the Extension Service and was appointed County Extension Director in Marion County in 1996 with an appointment in Commercial Horticulture. He has served since that time as County Pesticide trainer with licenses in Private Agriculture Application and Ornamental & Turf.